The cubital joint belongs to the group of hinge joints. Let's start with the most important issue - namely, the elbow joint has one joint capsule, in which 3 connection joints actually interact. Disruption of any one of them may lead to higher dysfunction of an upper limb, including hand restraint. The joint capsule also constitutes protection and stabilizes the joint in the extreme positions of the bones towards each other. Mainly, however, it is ligaments that constitute the stability of the joint. Both structures due to their function are exposed to high loads and therefore are often damaged during injuries. The head of the humeroradial joint is the head of the humeral bone, while its socket is the trochlear notch of the radius. The radiournal joint has the articular head on the articular circumference of the radial bone, whereas its socket is located on the radial notch of the ulna. This joint is not stabilized by the muscles, thus the ligament structures play a significant role here, since they are exposed to the large load during the force strain displacement, especially in lateral directions. Both the ligaments and the joint capsule, serving as the main elbow stabilizers, are particularly vulnerable to the damage during injuries. 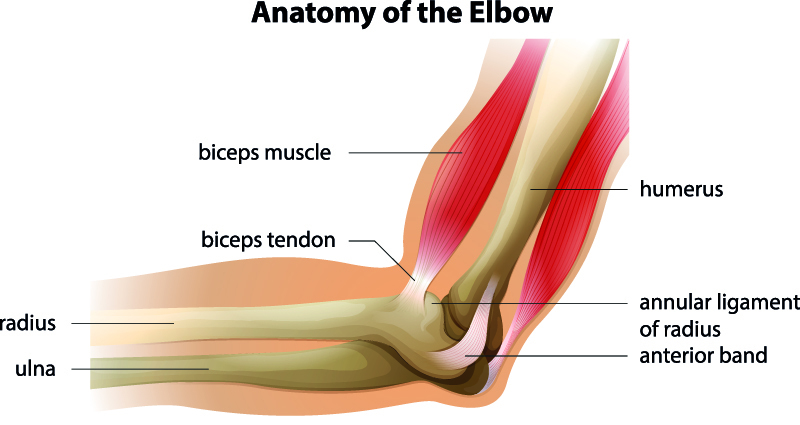 The most common pathology is so called 'tennis elbow' (Lateral epicondylitis) . 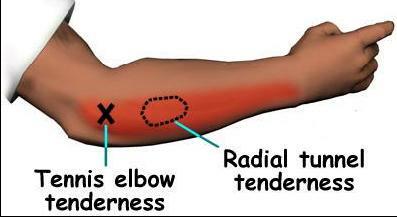 It is marked by the characteristic pain in the lateral part of elbow during gripping. The inflammation of the lateral epicondyle of the humeral bone is mostly caused by the overexertion of the wrist and fingers extensors. The disease usually affects men. The overexertion or the repetitive injuries may lead to the fibrosis and micro-tears of the exposed tissues. The motion which induces the symptoms is the resisted wrist extension, combined with the forearm pronation, or the attempts to lift the chair. The bursitis (inflammation of bursae) is a disorder occurring mostly as a result of the excessive pressure. The main function of bursa is to reduce friction. The synovial bursa prevents the excessive friction, lubricates joints and facilitates the free sliding of the muscles and ligaments during movement. The inflammation of the bursa causes the symptoms of pain and swelling of the joint, which are increased by movement. Degenerative joint disease (osteoarthritis) may affect any joint and it includes the degenerative changes of both the articular surfaces and the tissues which surround them. It leads to the loss of the joint movement capabilities. The disease is caused by the damage to the articular cartilage ( protective layer surrounding the bones in the joints), followed by the damage to the bone covered by the cartilage. This kind of damage leads to the inflammation of the surrounding tissues. A sprain is the dislocation of the articular surfaces relative to each other, along with the tearing of both the joint capsule and ligaments. As for the sprained elbow, it usually occurs as a result of the falling on the outstretched arm. - strengthen the muscles straightening the wrist when screwing in light bulbs - it is a simple exercise involving imitating the movement of screwing the bulb with a bended elbow. An exercise which is the perfect workout.